AS PART OF our GE16 FactCheck series, we’re testing the truth of claims made by candidates and parties on the campaign trail. If you hear something that doesn’t sound quite right, or see a claim that looks great, but you want to confirm it, email factcheck@thejournal.ie. On Friday, we tested a claim made by one of the government parties against Fianna Fáil, so let’s turn the tables with this one. 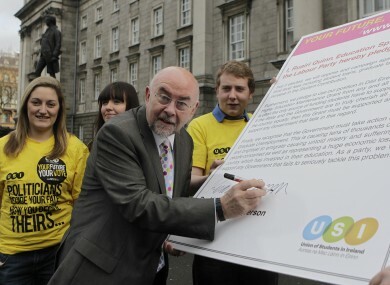 In the week before the last election, Labour leader Eamon Gilmore and Education spokesperson Ruairi Quinn publicly signed a Union of Students in Ireland (USI) pledge to “oppose and campaign against” any increase in the “student contribution charge,” whose maximum was at that time set at €1,500 for a full-time undergraduate. They also pledged to reverse the €500 increase made by then Education Minister, Fianna Fáil’s Mary Coughlan, which was to take effect in the 2011-2012 academic year. As Minister for Education, Quinn did not reverse that €500 increase, and along with his successor, Labour TD Jan O Sullivan, subsequently oversaw a €250-per-year increase in the maximum charge, to its current level of €3,000. Email “FactCheck: Did Labour really break a pledge not to increase student fees?”. Feedback on “FactCheck: Did Labour really break a pledge not to increase student fees?”.